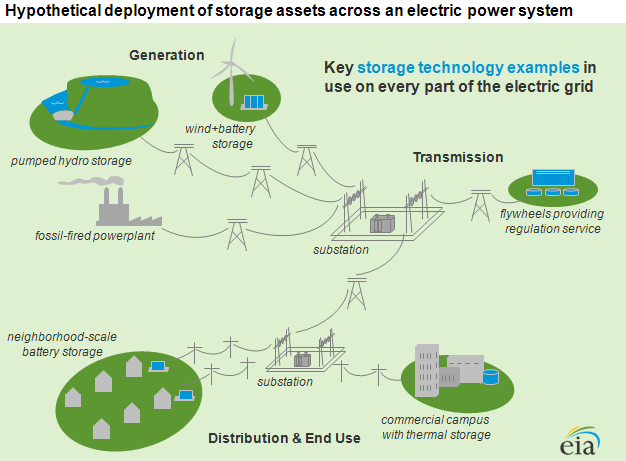 Electricity storage can be deployed throughout an electric power system—functioning as generation, transmission, distribution, or end-use assets—an advantage when it comes to providing local solutions to a variety of issues. Sometimes placing the right storage technology at a key location can alleviate a supply shortage situation, relieve congestion, defer transmission additions or substation upgrades, or postpone the need for new capacity. The examples above and below illustrate the wide range of storage applications, though neither is intended to provide a comprehensive listing of storage technologies. Some storage technologies are mature and fully commercial, such as pumped hydro and thermal storage. Others are still evolving in terms of technology and their economic and operational roles in the power grid, such as battery storage or flywheels. The costs can be significant when it comes to energy storage, particularly with emerging technologies. On the other hand, electricity storage technologies offer price arbitrage opportunities and fast-response services that conventional technologies cannot match. The future application of storage technologies will depend on how rapidly the technologies improve and costs drop, the implementation of new pricing and valuation schemes for the services storage can provide, and the cost and efficiency of alternatives. Source: U.S. Army Corps of Engineers. 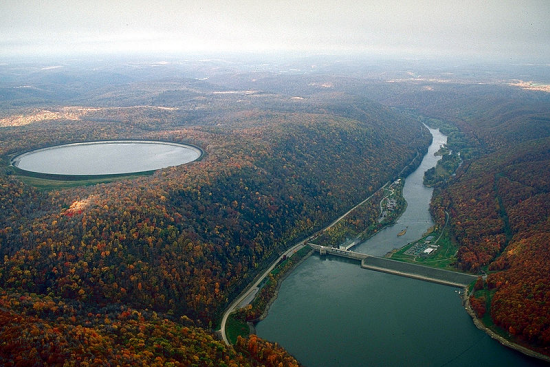 The Seneca Pumped Storage Generating Station in northwest Pennsylvania takes advantage of the local topography by filling a reservoir at a higher elevation than the dam below. The facility can be operated purely as a 435-MW hydroelectric power plant, generating power to supply demand for electricity, or as a pumped storage facility, providing energy management and load leveling services while taking advantage of differences in the wholesale price of electricity over the course of the day or the week. Overnight, a reversible hydroelectric turbine is powered by low-cost electricity from the grid, pumping water from the lower reservoir behind the dam (right) up to the upper reservoir on the bluff (left). During the daytime peak hours, this water is then released back "downhill" and through the hydroelectric turbine to produce electricity, which is sold to the grid at the higher, on-peak prices. Pumped storage is a long-proven storage technology, however, the facilities are very expensive to build, may have controversial environmental impacts, have extensive permitting procedures, and require sites with specific topologic and/or geologic characteristics. As estimated in a report commissioned by EIA, the overnight cost to construct a pumped hydroelectric plant is about $5,600/kW, higher than the $3,100/kW for a conventional hydroelectric plant. A conventional natural gas combustion turbine, which might be used to supply the peak daytime power added by the pumped storage plant, is $1,000/kW, though hydroelectric operating costs are much lower than those of a combustion turbine. 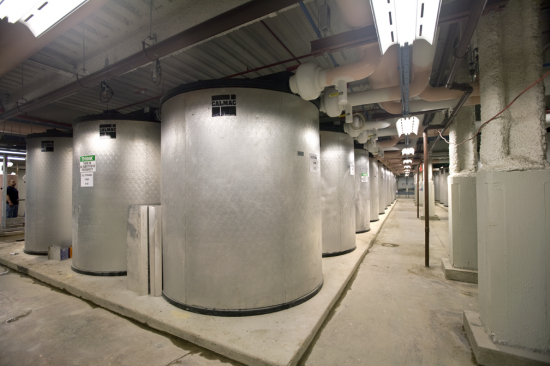 The cooling tanks in the photo above are in the basement of 1 Bryant Park in New York City—the first commercial skyscraper in the United States to achieve LEED Platinum status. For smaller buildings, thermal storage products like the IceBear are designed to connect to a typical direct-expansion air conditioning system. Thermal energy storage, perhaps the most economical and widely-used energy storage technology, is usually placed at the site of electricity consumption. Storage lowers a building's electricity costs by shifting the time of day when the building runs its cooling system. Instead of running an electric air conditioner on a hot afternoon when power prices are highest, thermal storage uses produces ice, or chills a coolant, overnight when electricity costs are lower. The system then circulates air cooled by the storage medium through the building the next day. In addition to lowering the customer's electric bill, this also benefits the local utility, by reducing their afternoon load ("peak shaving"), eliminating or deferring the need for expensive peaking generating capacity. Finally, a building paying off a thermal storage installation has more stable and predictable monthly expenses than one dependent on electricity-powered air conditioning. Thermal storage can also be used at concentrating solar power plants. The storage medium, such as salt, stores daytime heat, using it to produce electricity after the sun goes down or during cloud passage. Solar thermal storage extends the time period over which a concentrating solar plant can produce electricity, but the technology adds cost and complexity which to date have limited its adoption. The variability of the output from wind farms can create problems for power grid operators. 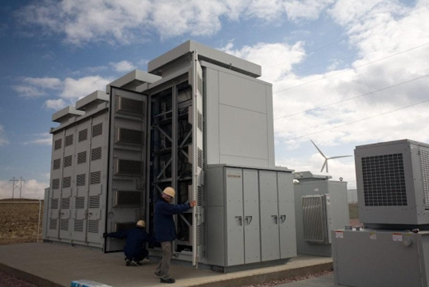 A 1MW sodium-sulfur battery installation in Luverne, Minnesota is testing the ability of storage to support, or "firm up," generation from a nearby 11 MW wind farm. The southeastern Minnesota region has a particularly high concentration of wind generators. Reducing the impact of variable generation on the local electric power system is a high priority. The $4.2 million project was funded by project participants and by a $1 million grant from Xcel's ratepayer-supported Renewable Development Fund. While the integrated wind-storage system provides one approach to the challenge of integrating variable generation, the project found that 0.2 - 0.4 MW of storage would be needed to firm each 1 MW of wind. Though battery costs continue to decline, integrating storage in this manner would add significant expense to a wind project. In addition to demonstrating and testing the usefulness of an integrated wind-storage system for addressing wind power variability, the project also looked at means of optimizing revenue from the storage component. For example, Xcel has tested the battery's ability to automatically adjust its output in response to the spot price of electricity. Source: National Energy Technology Laboratory (left), U.S. Department of Labor (right). The neighborhood-scale battery undergoing testing in the left-hand photo may soon be installed next to a ubiquitous green transformer box like the one on the right. This is an example of storage on the distribution system. Utilities can strategically place a set of battery installations like this to defer expensive upgrades at a local substation. Detroit Energy (DTE), in partnership with the National Energy Technology Laboratory, plans to deploy 20 Li-ion batteries in Northville, near Detroit, Michigan. Each battery has an instantaneous maximum output of 25 kilowatts (kW), or a total discharge of 50 kilowatthours (kWh). Together, they can serve half a megawatt of demand, relieving stress on the local infrastructure at times of peak demand. The U.S. Department of Energy's Energy Storage Program notes that "most of current [energy storage] technologies are not competitive in capital cost and/or life cycle cost for broad market penetration." The fast pace of technology development and limited pool of existing systems result in a wide range of battery project costs (see project examples from the American Recovery and Reinvestment Act). In a 2010 report, the Electric Power Research Institute quoted costs for kilowatt-scale (neighborhood-scale) devices ranging from $400-950/kWh for the more mature lead-acid batteries, to $950-3,600/kWh for Li-ion batteries like those in the DTE pilot. Reductions in battery costs are being aggressively pursued in the context of electric vehicle programs, which could also directly impact stationary storage applications. Sandia National Lab has developed a tool to aid cost-based decisionmaking around storage technology choices. 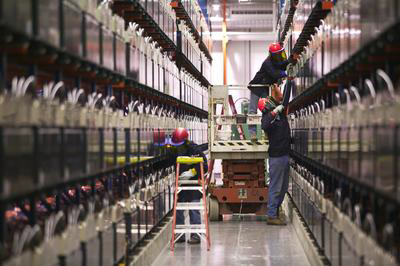 The Battery Energy Storage System, or BESS, is one of the largest in the world, providing quick response backup power for the Golden Valley Electric Association (GVEA), a largely rural electric cooperative in Alaska. Golden Valley provides power to Fairbanks and a large, remote service area generally south towards Anchorage. Unlike the interconnected power grids in the contiguous 48 states, Golden Valley and other Alaskan utilities are much more isolated from each other and must depend on their own resources in an emergency, making customers more vulnerable to outages. BESS provides instantaneous generation during an emergency, giving system operators time to bring conventional backup generators online. The utility posts statistics on the number of outages BESS covers and the average number of prevented outages per meter (for 2010, these were 18 and 4, respectively). BESS, built by ABB and commissioned in 2003, is made up of almost 14,000 individual nickel-cadmium (Ni-Cad) batteries that can provide 26 MW of power for 15 minutes, or up to 40 MW for 7 minutes, in temperatures down to -52°C (-62°F). The facility covers an area bigger than a soccer field. The cost for BESS was significant, at $35 million. In a locale with such exposure to outages, the project cost would be weighed against the costs of frequent and extended blackouts—in extreme cold weather—over the battery system's expected 20-30 year lifetime. GVEA investigated different battery types, settling on nickel-cadmium batteries, which were more expensive than the lead-acid option, but required less maintenance.